Back-to-back with the Royal Belgian Economic Mission to Morocco, the EU-Africa Business Summit will offer a new perspective on economic relations between African countries and the European Union. The Summit will see one day of sessions focusing on investment opportunities in line with the EU External Investment Plan (EIP) including innovative, sustainable agriculture and tackling the digital divide in Africa, among others. 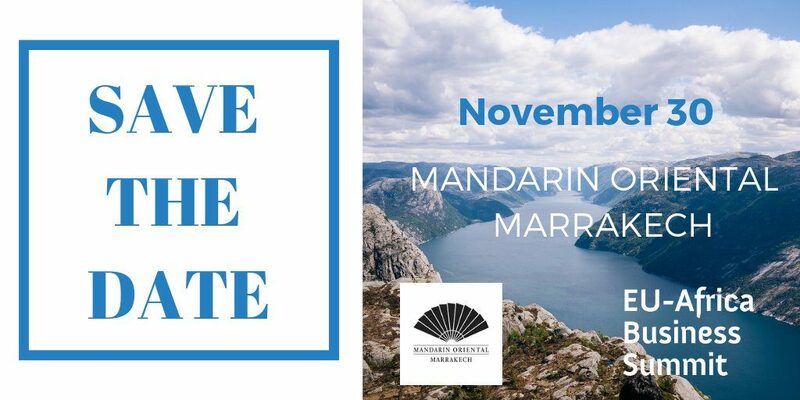 The Summit, taking place in the prestigious setting of the Mandarin Oriental Hotel in Marrakech, will bring together national and European policy-makers, business leaders and experts in order to forge a worthwhile and fruitful collaboration to strengthen the future economic dialogue. Cette entrée a été publiée dans Adrns, Colloques & Séminaires, Projets Afrique et étiqueté afrique, Diaspora, Europe, financement, Marrakech. Sauvegarder le permalien.